Which UK airport has the worst delays for departing flights? London Luton is the worst UK airport for flight punctuality with departures from the Bedfordshire hub leaving on average 19.7 minutes late, new data has revealed. London Gatwick was second worst with an average 18.9 minute delays, followed by Jersey on 18.7 mins and Durham Tees Valley on 18.6 mins. In contrast, London Heathrow, the UK's busiest airport, was found to have the best performance, with aircraft typically taking off 11 mins late. Leeds Bradford and Belfast both had the second best record on 11.3 mins, followed by London City on 11.6 mins. Passengers leaving the UK face an average delay of 15 mins at all major UK airports. The data from the Civil Aviation Authority (CAA) analysed by the Press Association takes into account every scheduled and charter flight from 25 of the UK's airports in 2017. Cancelled flights are not included. Responding to the rankings, a Luton spokeswoman said: "We regret any delay our passengers experience." She (Munich: SOQ.MU - news) added that punctuality was influenced by "many factors" outside its control such as air traffic control strikes, late arriving aircraft, bad weather and congested airspace. Gatwick said it is doing "everything within its power" to improve the proportion of its flights that depart on time, including using new technology to predict and recover from late running flights and speeding up the time it takes to turn around inbound aircraft. 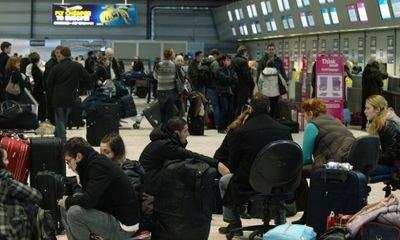 A CAA spokesman said punctuality data enables passengers to "make informed choices about which airports they fly from". "The aviation industry should constantly strive to improve punctuality to enhance the passenger experience," he added. Passengers on delayed flights from UK airports are entitled to assistance and compensation depending on the cause and length of the disruption. When flights are delayed for more than two hours, airlines have to provide free access to phone calls or emails, meals and refreshments, as well as hotel accommodation if an overnight stay is required. Passengers can also claim compensation when flights are delayed by more than three hours unless there are "extraordinary circumstances" such as severe weather or a security alert. Alex Neill, from consumer group Which?, said delays are "one of the most frustrating things about travelling" and urged passengers to "claim what they are entitled to".